About five years ago Sangria was my go-to drink. A sweet, chilled glass served as my weekend wind-down and my mid-week pick-me-up. 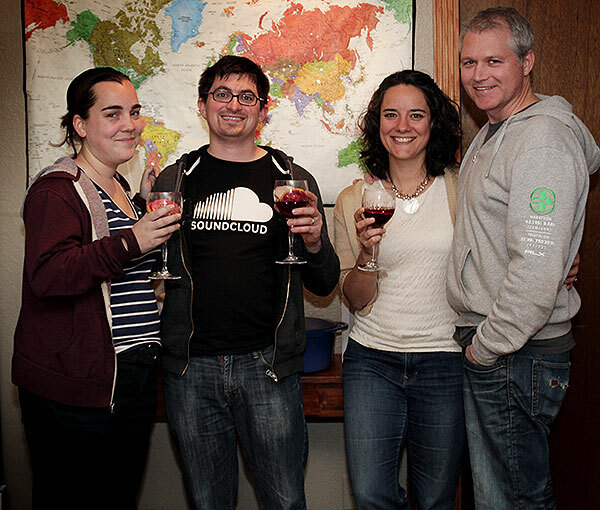 I sipped the ruby red goodness with friends… and it brought us joy, whether we were laughing or crying. Sangria became such a standby, I even served it at our engagement party in 2007. … this feels like a lifetime ago… and I suppose it is, because it’s pre-Ava’s lifetime. But, back to the Sangria. Despite my initial flush of excitement with this Spanish drink, I eventually fell out of love with Sangria; the flavor grew to seem one-dimensional and way too sweet. I suppose the drink felt rather like dating a pretty boy. The fling was nice for a while, but without mutual interests – something deeper – the romance fizzled all too quickly. Then I made a batch of Sangria from scratch. Let’s just say I fell back in love. I made one major change: I didn’t include any sugar. 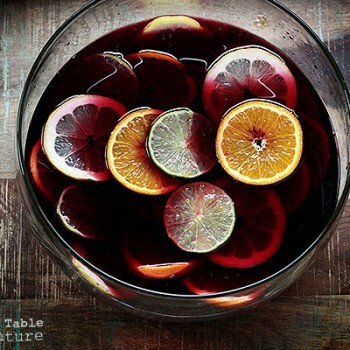 Most recipes do include some sort of simple syrup, but Mark Bittman tells us in The Best Recipe in the World that traditional, old school Spanish sangria was nothing more than mediocre wine spiked with lemon juice… the flavor was bright but tart, and majorly citrusy. Bottom line? There’s no need for sugar. Once the sugar was off the table, I had to make up for the sweetness in other ways. I turned to the sliced fruit (sticking to traditional citrus) and decide to squeeze in a little extra juice from the ends and never looked back. Go to a Spanish market and buy all the oranges, lemons, and limes you can carry. Breathe in their beautiful scent and smile. Fruit stall in a market in Barcelona, Spain. Photo by Daderot. Next, pour the merlot and triple sec into your desired container, such as a wide mouthed pitcher or a pretty, little punch bowl. Slice the fruit in rounds, leaving a chunky bit from either end unsliced (see photo below). Squeeze these chunky end bits into the wine mixture for added fruitiness (discard after squeezing). 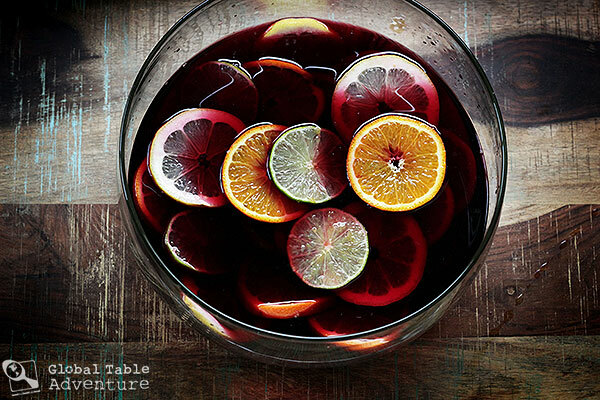 TIP: If you’d like your Sangria sweeter, you can squeeze up to an entire orange. Finally, toss in the sliced fruit and give everything a good stir. A small batch of Sangria, just perfect for a TGIGF. Ok, now let sit overnight in the refrigerator (or no less than 2 hours). Serve over ice, adding several slices of fruit to each glass. Enjoy with friends, old or new. And let the smiles come straight to you! Do you drink Sangria? Why or why not? Would you consider making it? If you already do, do you have any tricks for us? 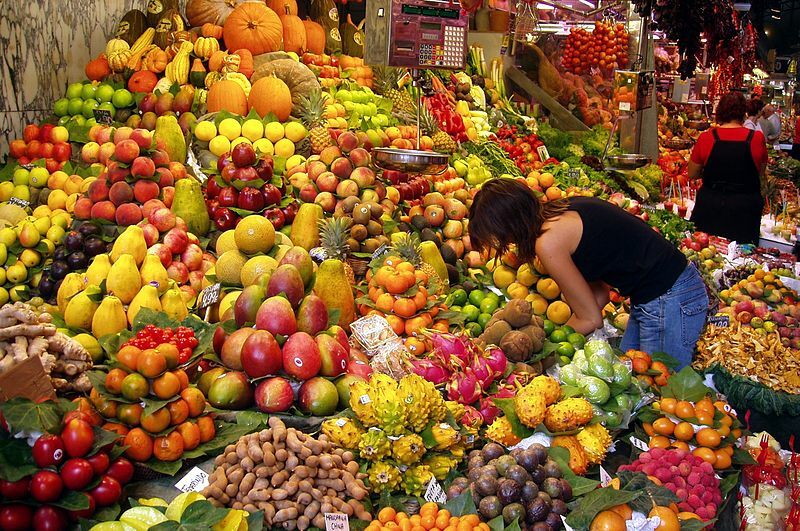 Go to a Spanish market and buy all the oranges, lemons, and limes you can carry. Breathe in their beautiful scent and smile. Next, pour the merlot and triple sec into your desired container, such as a wide mouthed pitcher or a pretty, little punch bowl. Slice the fruit in rounds, leaving a chunky bit from either end unsliced (see photo below). Squeeze these chunky end bits into the wine mixture for added fruitiness (discard after squeezing). 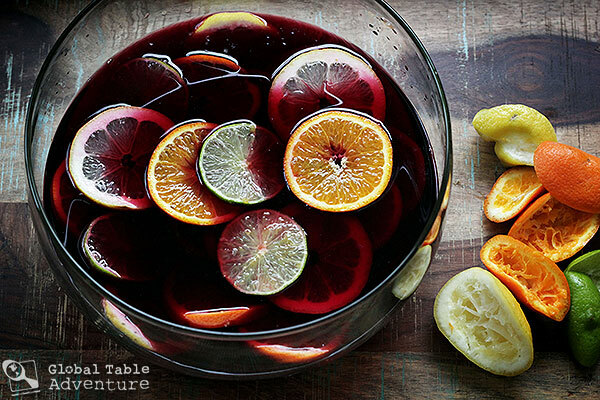 TIP: If you’d like your Sangria sweeter, you can squeeze up to an entire orange. Finally, toss in the sliced fruit and give everything a good stir. That’s it!! So easy. 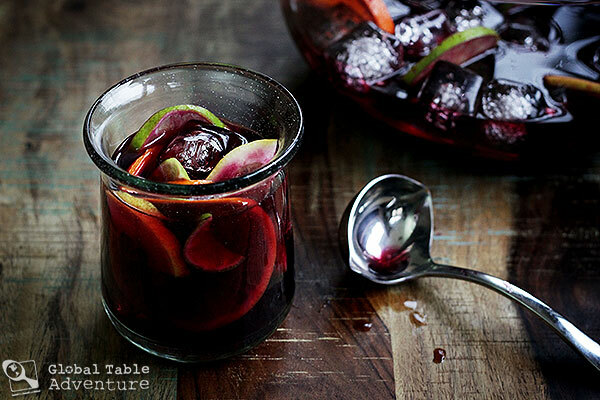 Sangria has long been my go-to party drink. I will sometimes make it with sweet white wine, which eliminates the need for sugar. Depending on what’s in season, I often add apple or pear wedges (only very firm fruits), which taste delicious when you munch on them after you’ve emptied your drink. I loved nibbling the soaked orange slices… almost more than sipping the Sangria… love the sweet white wine idea – sounds refreshing. Whoa, you’re engagement photos look like they’re straight out of a Vogue shoot. Those are the same chairs from my weekly video, though I’m not sure I’m the same girl ha! What wonderful writing, and what glorious photographs. I found your sit through Food for the Thoughtless, and I am so glad I did. Complimenti! Hooray for sangria! This was a huge drink for us in grad school–largely because a certain bar slash pizza place had a special sangria that was to die for in the hot Michigan summer. I haven’t had any in far too long a time–thanks for the reminder! 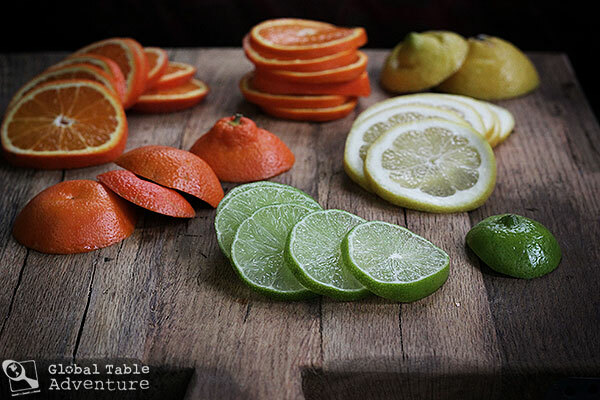 It’s such a perfect summer drink, I can imagine the slices with it… yum! 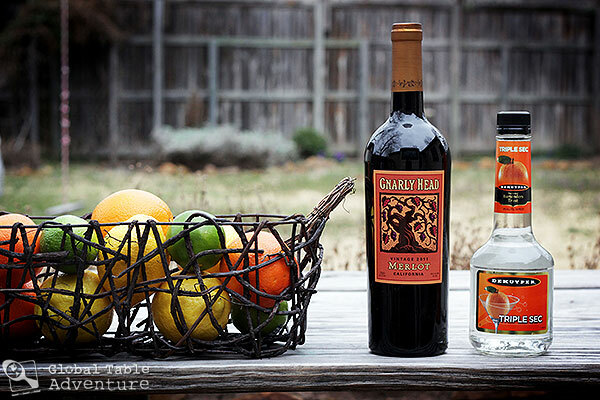 Thanks so much for the beautiful blog about sangria, my favorite wine drink! 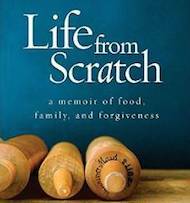 Lacking Triple Sec and after reading hanna’s comments, I’m off to try this with sweet red wine, tangerines, and lemons. Sangria was my go to drink years ago too. But i lost my original recipie, and tried another which turned out too boozy. I didn’t want to be drunk, I just wanted something refreshing. So I gave it up. Your recipie sounds wonderful, can’t wait to try it. Thanks for reminding me how great it is. You can always add more fruit juice to knock down the booze a bit (or cut down on the triple sec). Enjoy! And speaking of eating the fruit . . . 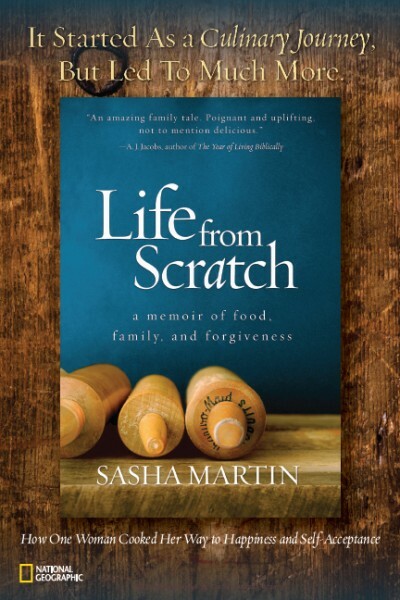 When I was pregnant with my first child I craved sun tea with lemons. I would slice the lemons in circles ( like you did above) and let them soak and soak in the tea. Then, I would eat them rind and all. Has anyone else done this with the rinds? Or was it just a crazy pregnant craving? I have been waiting for Spain since the adventure began! Hooray for sangria! 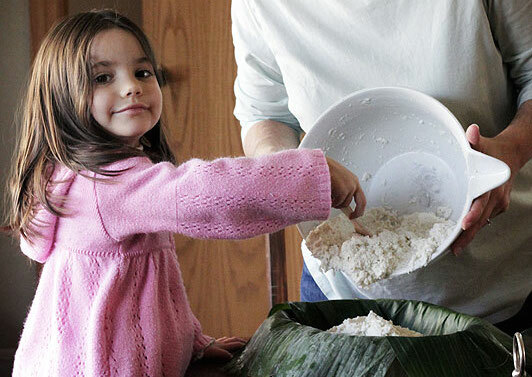 Thank you for sharing a recipe without the extra sugar. I often find restaurant sangrias too sweet. It feels like my mouth is coated in sugar – and not in a good way. I can’t wait to try this one.